I have decided to include verse 1 in all the following 7 “A time for everything” scenes & article notes, to remind the viewer of the point of the list (verses 2-8). Now to the particulars: verse 2 – “a time to be born and a time to die, a time to plant and a time to uproot,” the polar opposites in this verse are birth & death, planting & uprooting. The poem begins in reference to birth (the beginning of a person’s physical life) and death (the end of a person’s physical life), neither of which that person has any control over. When we are born, & how long we live (when we die) is determined by God in heaven. 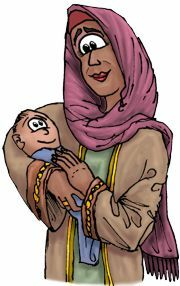 In my picture I have shown a woman holding a baby in the top left hand corner, which is indicative of birth. I have shown a grave (with R.I.P. Rest In Peace, engraved on the surface) with lilies (often used as grave-side floral tributes) & a crow (the black bird) clinging to the gravestone. 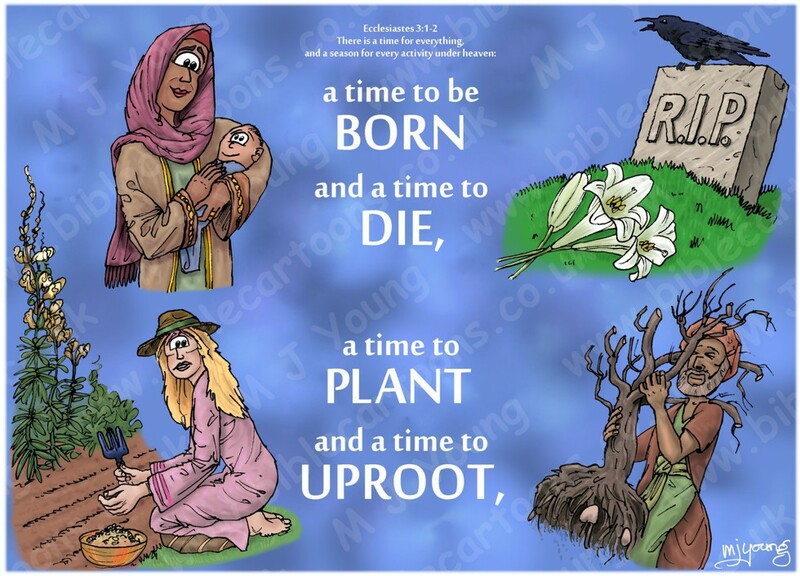 By referring to plant birth (planting) & death (uprooting) king Solomon is possibly restating the life & death condition he begins the poem with. The Message Bible version refers to “reaping” in verse 2, or harvesting at the proper time, that which has been planted. Reaping could be seen as plant death. In my picture I have represented these two states (planting & uprooting) with the woman on the bottom left, who is tilling the soil of a garden & has some seeds in a pot by her knees, & with a man on the bottom right of the picture carrying a tree he’s uprooted! It is possible to see the end of a person’s life (referred to as “reaping” or “being harvested”) in other parts of the Bible. In Matthew 9:37-38, Jesus refers to the “harvest” of people *1. Similarly in Jesus’ parable of the weeds (Matthew 13:30) two distinct groups of people are referred to metaphorically: the wheat (righteous people, saints, the saved) & the weeds (unrighteous, wicked, unrepentant people). You can read what happens to each group at the end of time *2. Hebrews 9:27 refers to our inevitable physical death & the following judgement *3 whilst the harvest of the unrighteous people is referred to in Revelation 14:14-20 *4 & the judgement of the dead is seen in Revelation 20:11-15 *5. 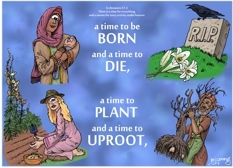 We have seen that King Solomon started his poem of all human activity with birth & death; planting & uprooting. As a literary “echo” of that beginning, he also ends his poem with similar thoughts of birth & death, in reference to verse 8’s “a time for war & a time for peace”. 37 Then he [Jesus] said to his disciples, “The harvest is plentiful but the workers are few. 14 I looked, and there before me was a white cloud, and seated on the cloud was one “like a son of man” with a crown of gold on his head and a sharp sickle in his hand.